Sri Aurobindo Foundation for Indian Culture (SAFIC) recently conducted a 2-day National Workshop on ‘Sri Aurobindo’s Integral Education’ in collaboration with the School of Education (SOE), Pondicherry University (PU). This workshop was held on March 25–26, 2019 at the School of Humanities Building on the Silver Jubilee Campus of the university. The workshop planning took about a month and SAFIC team worked closely with the Dean’s office of School of Education. 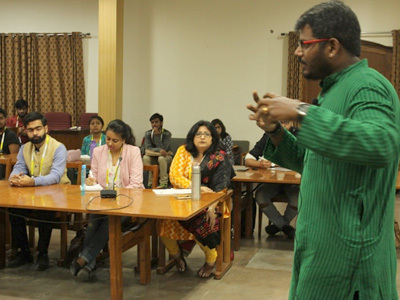 The final programme included several important sessions designed to give the participants a meaningful introduction of key aspects of Integral Education. Participants included students enrolled in the B.Ed. programme in several university-affiliated colleges, M.Ed. students and research scholars in the Ph.D. programme, as well as several guest faculty members teaching at the School of Education. For a full report of the workshop, including summaries of the various sessions, please click HERE. 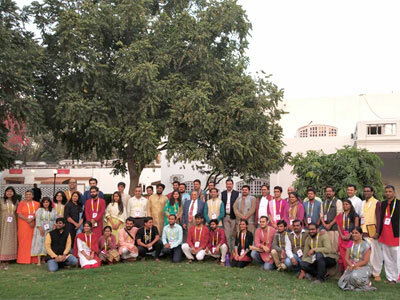 From March 13 to 17, 2019, Sri Aurobindo Foundation for Indian Culture (SAFIC) was one of the organizing partners for the ‘Abhyudaya Conclave’ – a unique multidisciplinary programme organized by Vision India Foundation and supported by Indira Gandhi National Centre for the Arts(IGNCA), Ministry of Culture, designed to express this spirit of a comprehensive national awakening. SAFIC conducted its annual Sanskrit for Beginners course, titled ‘Spandana: Feeling the Pulsation of a Divine Language’ from January 20 to 26, 2019. A group of 18 individuals, from different parts of the country and some from abroad, young and old, diverse and alike, participated for this week-long intensive course conducted at Society House. The course was facilitated by SAFIC Director, Dr. Sampadananda Mishra. Sessions covered topics such as Learning through Mantras, Learning the Alphabet and Grammar in Creative Ways, Spoken Sanskrit and others. On January 9, 2019, SAFIC organised a Special Lecture by Dr. Kundan Singh, titled “Sri Aurobindo and Renaissance in India.” The event was held at the Society Beach Office, and was attended by about 40 participants. This was the fourth edition of the SAFIC Special Lecture Series. Dr. Kundan Singh opened his lecture with a brief general introduction to the place India and the unique and distinct spiritual character of Indian civilization and culture held in Sri Aurobindo’s larger vision for the humanity and the world. Quoting some of the key insights from Sri Aurobindo’s essays titled ‘The Renaissance in India’, he highlighted what he thinks may be understood by Sri Aurobindo’s emphasis on the ‘recovery of the old spiritual knowledge and experience in all its splendour, depth and fullness’ as the first and most essential work that must be done for a renewal of India’s unique civilizational spirit. He spoke about some of the existing ideologically-driven narratives on India and Indian culture which hamper the much-needed intellectual process of a sincere quest for the truth about India. Speaking on the necessity of a deeper educational rethinking in India, Dr. Singh emphasized the need for nurturing and unleashing the power of thought in a way that uplifts the consciousness of students. Dr. Mishra explained in a simple language how to live a spiritual life by following certain inner disciplines. Sri Aurobindo’s famous statement ‘All Life is Yoga’ was elaborated in the talk. 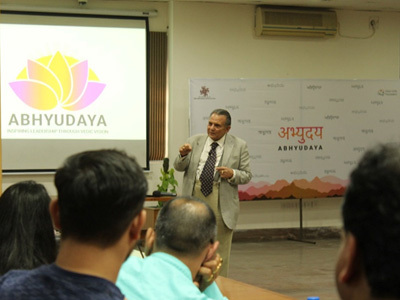 This talk was attended by many dignitaries and elites connected with Vigyan Samiti, Udaipur, and members of the Sri Aurobindo Society, Udaipur. On December 6, 2018, Dr. Mishra delivered a lecture on the ‘Principles of Integral Education’ for the students and faculty of Nimbark Teachers’ Training College, Udaipur. Dr. Mishra explained about the greatness of ancient Indian education system, the principles of Integral Education, and how Integral Education experiment is taking place at the Sri Aurobindo International Centre of Education in Puducherry. The examples and stories Dr. Mishra shared with the participants to make them clear about various facets of Integral Education were highly appreciated by the participants. At a Satsang (spiritual congregation) organized at the Sri Aurobindo Society, Jaipur Branch on December 9, Dr. Sampadananda Mishra spoke on the ‘Practical Aspects of Integral Yoga’. Living one life in the midst of many lives, constant remembrance of the Divine, performing all actions with the right attitude, purity and intensity in aspiration, surrender, opening oneself to the Divine, these were few major points that Dr. Mishra elucidated on for the members present. Dr. Sampadananda Mishra conducted a six-day Sanskrit intensive course for some of the active members of Vision India Foundation from December 25 and 30, 2018. The course venue was at the Keshav Srushti campus, Thane. In this beautiful campus of 300 acres, it was a delight to be immersed in the dissemination of the divine language Sanskrit. The participants were mostly brilliant young minds aspiring to be the future leaders, bureaucrats, policymakers and change makers. In these six days, they were exposed to various facets of Sanskrit such as its creative power, magic and logic, chandas, scriptures, stories, rhyming songs, mantras, conversational Sanskrit, etc. Most of the participants felt happy to get a holistic understanding of the Sanskrit and Indian culture through this workshop. On December 28, 2018, Dr. Beloo Mehra, Research Associate, Sri Aurobindo Foundation for Indian Culture (SAFIC) presented a talk on “Sri Aurobindo and Indian Culture” to a group of about 20 visitors from West Bengal who were attending a study camp organized by Sri Aurobindo Action, West Bengal chapter. The natural and serene ambience of the open-air, under-the-tree setting at Udavi School, Auroville provided the relaxed backdrop for an almost 3-hour-long session, divided into two smaller sessions with a tea break in between. Beloo organized her presentation in an interactive format with a brief introduction of the topic as she interpreted it, and then encouraging the participants to share their thoughts and insights on some of the questions she raised for discussion. A one-day retreat for a group of about 25 senior managers and management executives from iLink Systems – an ISO 9001:2008 Certified Global IT company – was organized by Sri Aurobindo Foundation for Indian Culture (SAFIC) on December 20, 2018. 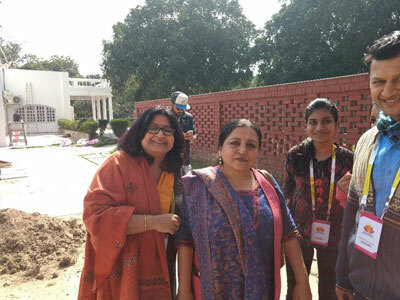 The programme was conducted at the Society House of Sri Aurobindo Society. The Samskrita Bala-Sahitya Parishad, an initiative of Sri Aurobindo Foundation for Indian Culture (SAFIC), and Sri Chandrasekharendra Saraswathi Viswa Mahavidhyalaya (SCSVMV), are jointly organizing a three day National Seminar titled “Children’s Literature in Sanskrit” from April 4 – 6, 2018 to generate ideas related to the topic and to understand how Sanskrit can be brought to children in various innovative ways through literature. Sacred scriptures comprise only 12-15% of all the Sanskrit literature available from the Vedic to the pre-modern times. Nonetheless, they form the bedrock of Indian culture and spirituality. To approach the Vedas, the Upanishads and the Gita not from a scholastic point of view, but rather to understand the living message pulsating in their words is the aim of this workshop. By plunging into the philosophy of these scriptures, by gleaning their symbolism, and through a focused understanding of some of the significant words, verses and stories mentioned in these scriptures, the participants can begin to appreciate the significance of the Vedas, Upanishads and the Gita in the modern day and how they can guide us in our day-to-day living. For a list of all the past events of SAFIC, click here.